Our primary content is US population, but just for comparation, we created this page, so you can get some basic information about world population statistics and to compare it with US data. 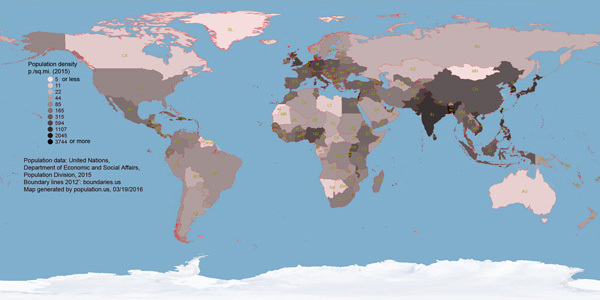 If you need more information about country population visit population.city/country page. Current population of the world is 7 552 113 355 people  and according to estimations, it will reach 8 billion in 2024. Every second earth population is growing by 2.6 (birth rate is 4.5 babies/sec and 1.9 deaths/sec. 4.5-1.9=2.6). Estimated population for 2015. Population density is in p./sq.mi. Changes are for period 2010-2015. Value is %/year. Boundary lines approx. 2012 . Click to enlarge. What was world population at your birthday? 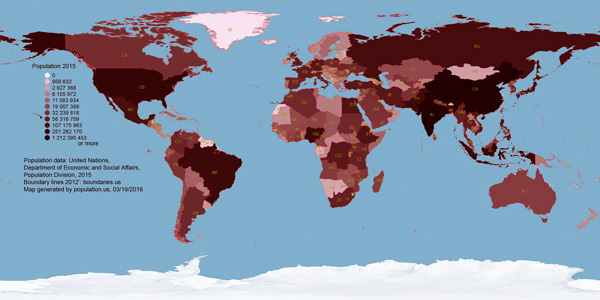 Value is US population in percent of total world population. Continents population growth rate in %. 1950 population is the base (this is 100%). 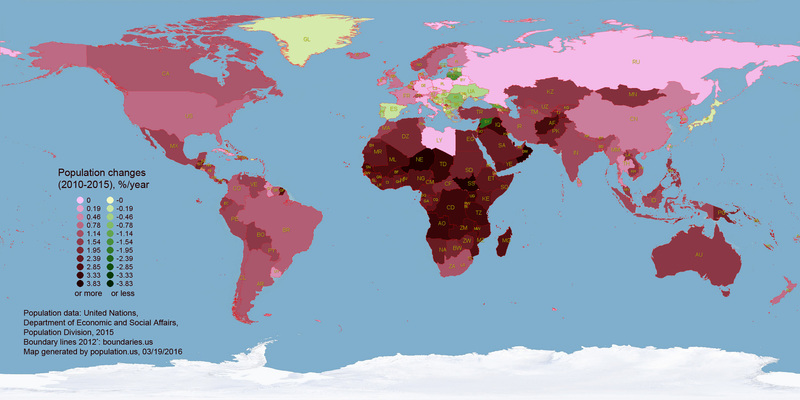 Values are in percent of population growth rate compared to 1950. Country population estimates 2016, 2050, 2100 (millions, medium fertility variant). UN, DESA, popul.div. Since middle of the 20th century world population growth exponential. Africa population don't show any slowing tender, that is big load for this continent. Long-term global population growth is difficult to predict. According to official estimates by UN, world population will reach 11 billions at the beginning of the 22th century and they predict that it will stabilise by then. Let's hope that Earth can feed this huge population..